I am a pickle fiend and relish a variety of regional cuisine traditional pickle recipes made by home cooks. With an abundance of tart home grown mangoes, I got down to making a small batch of aam ka achar or Punjabi mango pickle recipe. I had jotted down an authentic aam ka achar recipe from a Punjabi family who were our neighbors during my growing years. 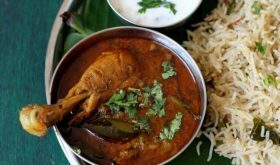 I have made it a couple of times and the flavor was spot on, just like the pickle I had relished at my neighbors home. I always look out for passed down family pickle recipes and try to preserve the cooking traditions of our elders. Recently at a family wedding, celebrations were in full swing with everyone indugling in revelry while I was sitting with a group of elderly relatives (read great grandmothers and grandmothers) jotting down culinary notes on a tissue paper about heirloom family recipes. Whenever I get a chance to spend time with family elders, our discussion centers around family culinary traditions. 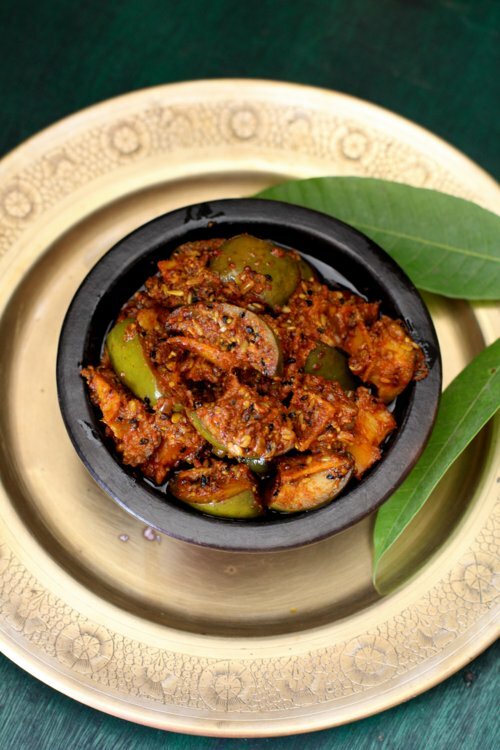 On Sailu’s Kitchen facebook page, I have been receiving requests to post regional cuisine based mango pickle recipes since its the season of mangoes. 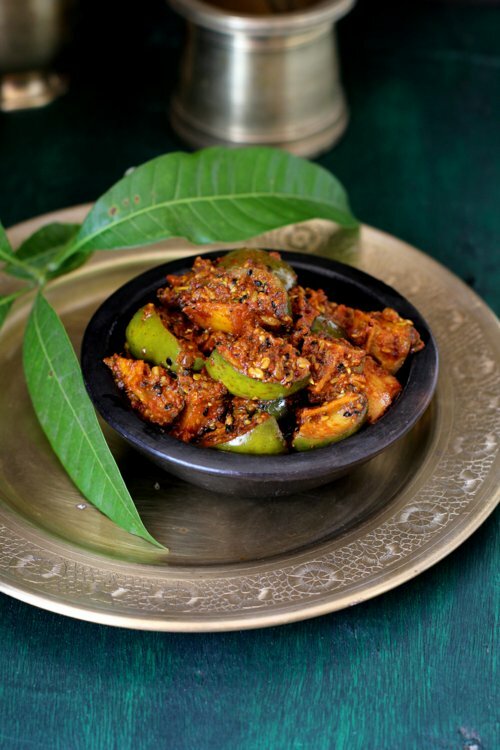 A few days ago, a loyal reader sent me a recipe request – “aam ka achar banane ki vidhi bataye” (how to make aam ka achar). By the time she had posted her request I had already finished making the pickle and I was waiting for it to mature so that I can blog aam ka achar recipe. One of the easiest pickle recipe provided you take certain precautions in cleaning the mangoes and keeping the pickling area moisture free as well as the jars which are used to store the pickle. 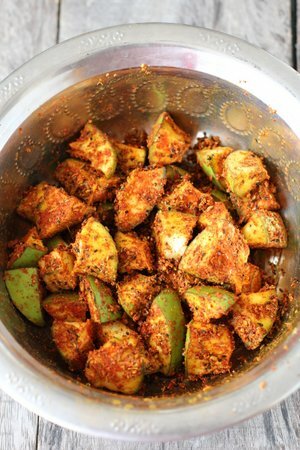 Aam ka achar preparation is completely different from the Andhra style or South Indian mango pickle. Whole spices like mustard seeds, fennel seeds, fenugreek seeds, nigella seeds, turmeric powder, red chili powder, salt and mustard oil are the main ingredients that go into the making of aam ka achar. Each home cook has her/his own unique blend of pickle masala based on the region/community they belong. Mustard oil or sarson ka tel is used to give the pickle its flavor. 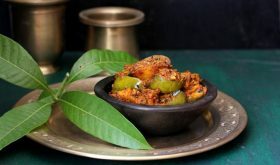 The recipe of aam ka achar that I am posting today is popular in Punjab and is best relished with hot parathas and mathri. 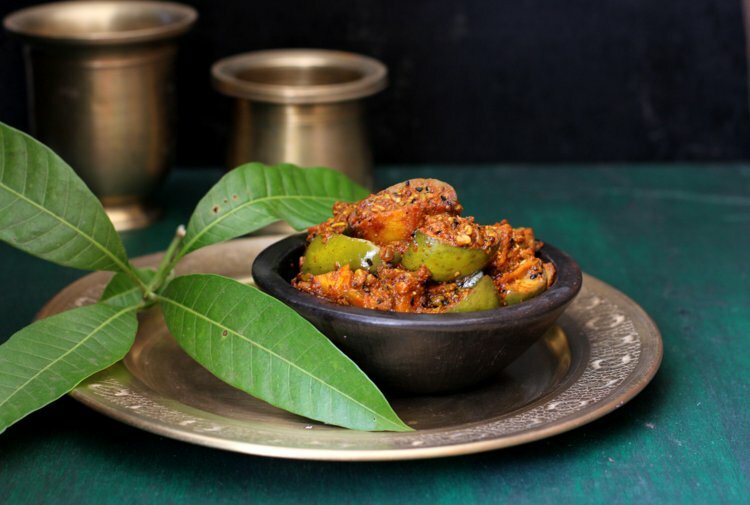 Do check out more regional cuisine mango pickle recipes like aam ka chunda or Gujarati sweet mango pickle, aam ki launji or mango chutney recipe and avakai or mango pickle recipe andhra style. Sun dry mustard seeds, fenugreek seeds, nigella seeds and fennel seeds separately for a day. Heat 100 ml of mustard oil till smoking point and turn off flame. Bring to room temperature. 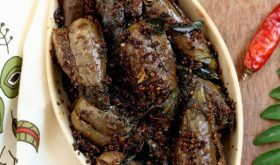 Coarsely crush fennel seeds and mustard seeds. Set aside. 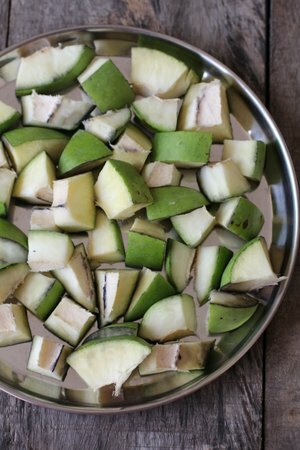 Place the cut green mangoes in a wide vessel. Add turmeric powder and salt and mix well. Add the crushed spices, nigella seeds, fenugreek seeds, asafoetida and red chili powder and mix well. Add the room temperature mustard oil to the vessel and mix well. Cover with a muslin cloth and place in the sun for a day. Remove the mango pickle from the vessel and place in a glass jar. Next day heat 100 ml mustard oil till smoking point and turn off flame. Bring to room temperature. Add the cooled mustard oil to the mango pickle and mix well. 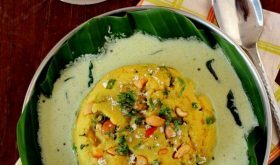 Ensure that the mango pieces are immersed in a layer of mustard oil. Allow the mango pickle to mature by placing the pickle jar in the sun for a week. The pickle can be stored upto a year. Aam ka achar is ready for consumption from day 8. 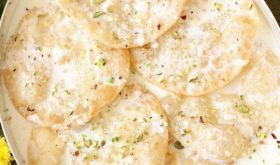 Serve with roti, paratha or mathri. There should be absolutely no amount of moisture at the pickling zone. The cut mango pieces are to be cleaned and dried with a clean cloth. Mustard oil should be heated to smoking point and cooled down completely before adding to the mango pickle. 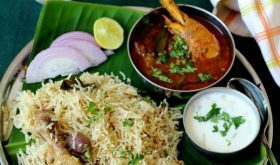 Mustard oil is recommended though you could substitute it with vegetable oil. If using vegetable oil, there is no need to heat the oil before adding to the pickle. I usually refrigerate aam ka achar as I make a small batch. If the pickle is immersed in a layer of mustard oil, it will stay good for a whole year without refrigeration. By Sailu Published: May 19, 2015 Aam ka achar, Punjabi mango pickle recipe made with Indian spices & mustard oil. How to make aam ka achar recipe popular among hindi speaking North Indians. You can keep it indoors. Its not an issue.